A distinctive building in the heart of the city, Kansas City’s Central Library occupies a century-old former bank building with soaring ceilings, marble columns, and heavy bronze doors. Within the handsome structure lies a screening room, meeting rooms for community events, a coffee shop, and a rooftop garden complete with a life-sized chessboard. The building offers a careful balance of quiet nooks and study areas, and spaces for public assembly. Technology is ever-present — but not over-bearing — in the Library’s information kiosks, catalogue stations, research areas, and signage. The effect is one of old-world craftsmanship outfitted with contemporary gear. 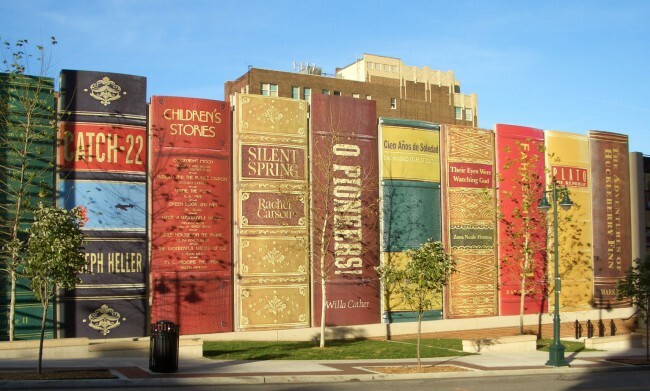 In a playful touch, the parking lot is wrapped in a mural of over-sized books. The Library serves the two million residents of metropolitan Kansas City, in particular the 220,000 residents of the City proper. With a mission to provide a doorway to knowledge for all, the Library was founded in 1873 and today offers 10 physical branches across the city, including the central one. About 2.5 million people visited the Library last year, checking out 2.3 million items, choosing books and other materials from its 1.1 million collection and requesting another 115,000 through inter-library loans. The Library’s dynamic public programming is among the most respected of any U.S. library. With support from the Ewing Marion Kauffman Foundation, the Library’s event archive reads like a who’s who of American writers, artists, historians, scientists, and other public thinkers and authors. Most of these events are archived in audio and video for those who can’t attend. The Library also creates exhibitions such as its award-winning Greetings from Kansas City: Postcard Views of a Midwestern Metropolis 1900-1950 displayed both downtown and at branches. Greetings from Kansas City culled 200 favorite postcards from the Library’s Missouri Valley Special Collections, attracting nearly 10,000 visitors. Online viewers also flocked to see the entire postcard collection digitally, spiking web traffic to the Missouri Collection’s digital image repository. All libraries promote literacy, but Kansas City’s Library stresses not just the ability to read books but also to be fluent digitally. The Library is a partner in the national YouMedia project, creating five digital media Learning Labs across the city where young people can learn to use media to “explore, express, and create” and become makers and doers, not only passive consumers, of digital media. They also learn programming languages since, as Kemper explains, “Code is text.” Research showed the Library staff that 70 percent of the Kansas City School District’s students do not have Internet access at home. 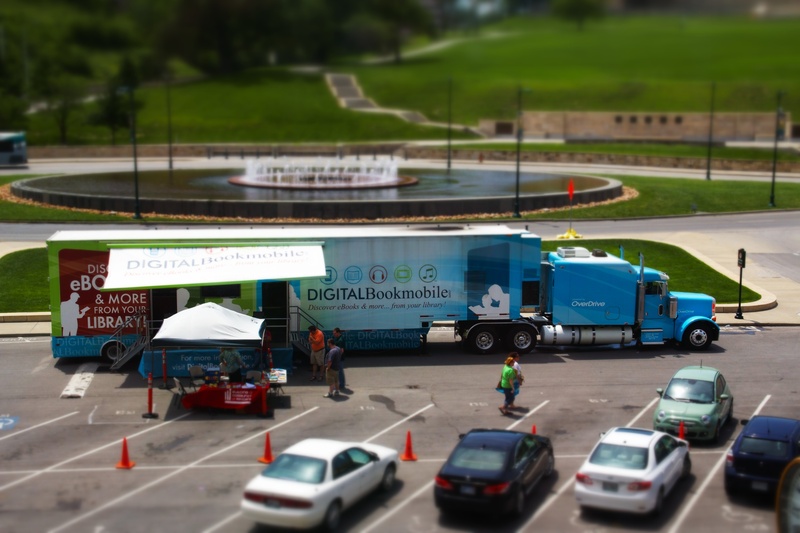 Thus the Library also offers free hot spots on loan to provide Internet access remotely for families and hosts meetings for the Kansas City Coalition for Digital Inclusion. Google’s decision to choose Kansas City for its Fiber program also will bring free high-speed access to dozens of community locations in the coming years, including Library branches. Among the Library’s digital innovations is a unique community-wide project that incorporates the collections of many other organizations. The Civil War on the Western Border has won several history prizes and was built in part with project funding from the Missouri Digital Heritage Project, the William T. Kemper Foundation, and federal Library Services and Technology (LSTA) support. It’s the first in a series of community collections the Library intends to develop focused on the region’s history. The Civil War project exemplifies the new ways libraries are collaborating in regional communities to make collections accessible to the public. As a research repository it includes 6,000 pages of searchable primary source material from 25 separate partner archives in Kansas and Missouri. The archives are seamlessly viewable from a central portal linked to the Library’s website and surrounded by essays, maps, and other information. A “related content” feature links the varied materials from all sources to ease research and encourage discovery beyond any one topic or entry. This relationship viewer is a unique element to the Civil War website that the Library hopes to employ in similar future collaborations. The Library’s role in the Civil War project not only involved conception and fund-raising but also responsibility for information architecture, staffing, digitization of archival materials from community partners, and ongoing project development. The work allowed the Library to strengthen its relationships with local historical societies and archives, provide technical infrastructure and expertise to a broad group of organizations, and make accessible materials that were previously distributed across separate databases and catalogues. 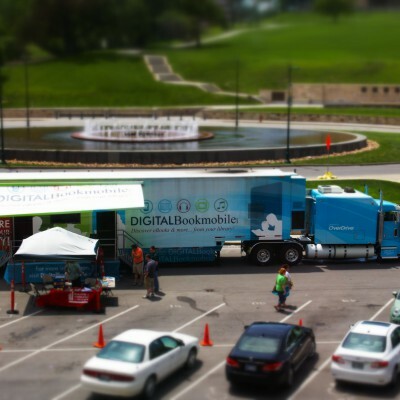 Like other libraries, Kansas City’s offers patrons e-content such as downloadable e-books and audio books, music, video, and subscription databases and magazines. In 2014 the library embarked on plans to build out a “digital branch” as the virtual 11th in its system. By aggregating its digital assets, the Library plans to experiment with innovative tools and techniques that enhance users’ experiences, creating customer service and support comparable to its physical branches. The new “branch” will also seek new content and service partnerships with regional health, education, and civic organizations to provide new information, centrally, to users. Overall, the Library is shaping its digital initiatives to improve mobile access to its resources and to reach more effectively immigrants, people with disabilities, youth, and seniors. New projects in the works include on-line book clubs, software lending, and a digital publishing platform for local authors.